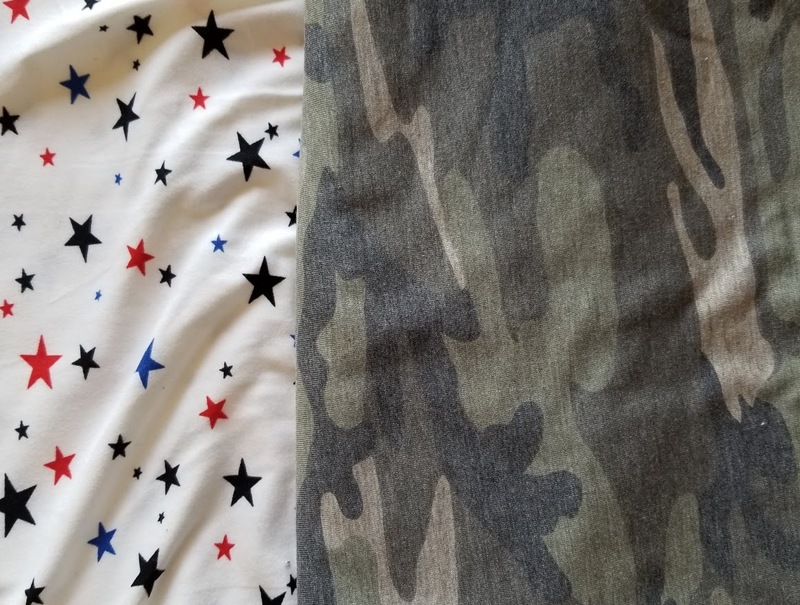 While I’ve had several good experiences on Wish, a few have been disappointing. Take this band shirt, I had purchased it for my husband, but then it arrived it was a weird (non-cotton) material and was pretty see-through… no way would he ever wear it. So after sitting on it for a month or so, I decided that I would just restyle it for myself. We are attending their concert in October and doing the meet and greet so I figured I had better whip up something fabulous. After a lot of thought and pattern surfing, I decided to resurrect Jalie 2794. It was always a great fitting pattern that came together well. 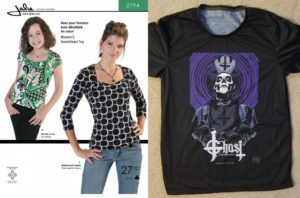 I figured with the right mix of fabrics I would have the perfect rock\gothy style going on. This entry was posted in Uncategorized on August 31, 2018 by stacy. This raglan sweatshirt is perfect for cool fall mornings – plus it’s perfect for layering over these v-neck tees (size large only). Fall is in the air which means scarves are back! In a rush? This infinity version takes a minute to make and is even no sew. While you’re visiting the site, be sure to enter to win 3 quilting books. Chapped lips will be a thing of the past when you carry you lip gloss in a handy pouch. Halloween has finally made it’s way into stores which has put me in the holiday mood. Now I think I need to make one of these adorable witch kitty plush. I love stitching up faux foods. These felt apples look easy to make and pretty realistic too! This faux fur blanket will help you stay cozy while you’re watching movies this weekend. Don’t have any faux fur? Enter to win some. This sewing machine cover is customized for your machine’s dimensions, plus it has a great front pocket for storage, too. These fabric boxes won’t just keep you organized, they collapse for easy storage. Need something a bit larger? Then be sure to check out my fabric basket tutorial. Celebrate the Labor Day holiday by stitching up one of these adorable US Map pillows. Back to school doesn’t have to be just about this kids, this laptop bag is perfect for adults. This entry was posted in Uncategorized on August 30, 2018 by stacy. Just in time for picture day at school tomorrow, the Converse button down is complete and paired up with the t-shirt from yesterday. 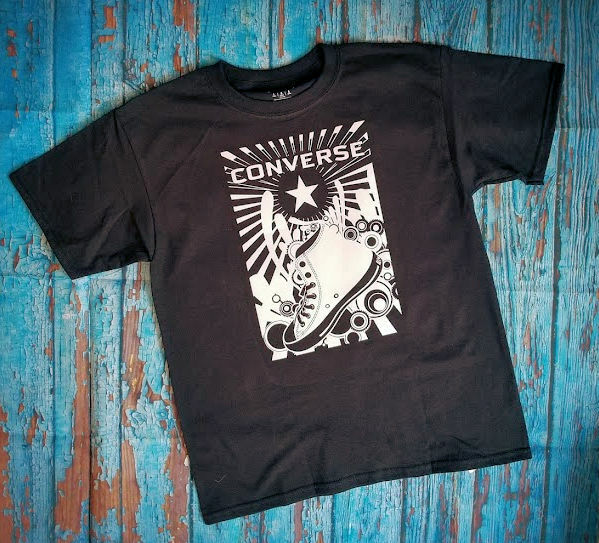 If you missed my previous post, I managed to only use 1 yard of of Emma One Sock‘s “Converse Collection” shirting with Peek-a-Boo Pattern’s Oxford pattern – not something I would ever recommend, but thankfully this print was wide enough to get away with doing it. Thankfully, everything came together without a hitch… in fact, dare I say this might be one of my best button-down creations that I’ve made! Sadly, this is the largest size in this pattern and after this year, Easton will be out of this pattern company. This entry was posted in Uncategorized on August 29, 2018 by stacy. Last week I had mentioned that I had started on a Converse button down for Easton. In the middle of sewing it, I decided that he needed something to go under it… so I made him a coordinating t-shirt. I searched for images on the internet and came across the one on the left – it was so cool that I couldn’t resist giving this one a whirl. I also used a flocked heat transfer vinyl to give it a more retro vibe. While cutting this went so much better than my last attempt, weeding it was a real booger (it’s hard to tell, but there are tiny little holes for the shoe’s stitching – a great effect, but tricky to remove). In the end, it was totally worth it because it’s such as bold design. This entry was posted in Uncategorized on August 28, 2018 by stacy. 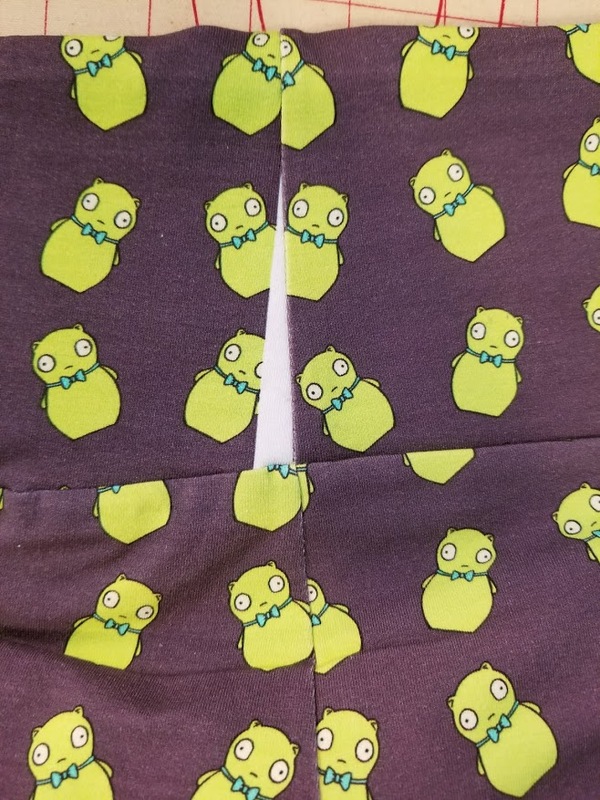 Before our weather warmed up again, I decided to make one more pair of leggings – a Kuchi Kopi print that I had purchased from Silver Fox Fabrics quite some time ago. 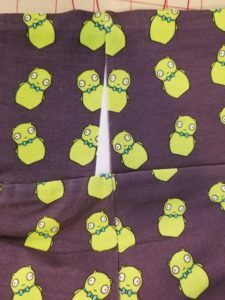 Once again I used the Clara pattern… Unfortunately, while one yard has been plenty to work with in other prints, it didn’t work out so well this time. I found this particular print to be really off grain. In an effort to fix it, I sacrificed my layout (I also believe that this is fabric isn’t printed quite as wide as some of the others) and wound up having to cut part of my waistband on the selvage (the selvage was extremely wide). The end result doesn’t look as bad as I anticipated (photo on the right), but it’s still not good. I figure my shirts will cover the white spot so it’s probably not a big deal, but when you sew, you know it’s there! This entry was posted in Uncategorized on August 27, 2018 by stacy. Picture day is coming up next week (I know, already?) and I thought I would try to make something for Easton to wear this time around. 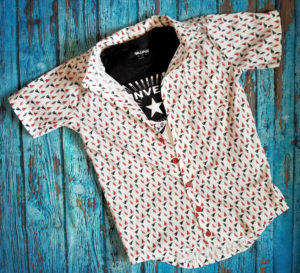 I’ve been dying to make a fun button down shirt with the Converse shoe print I picked this spring from Emma One Sock. Unfortunately when I bought this, I didn’t purchase enough to really do anything with it – or so I thought. 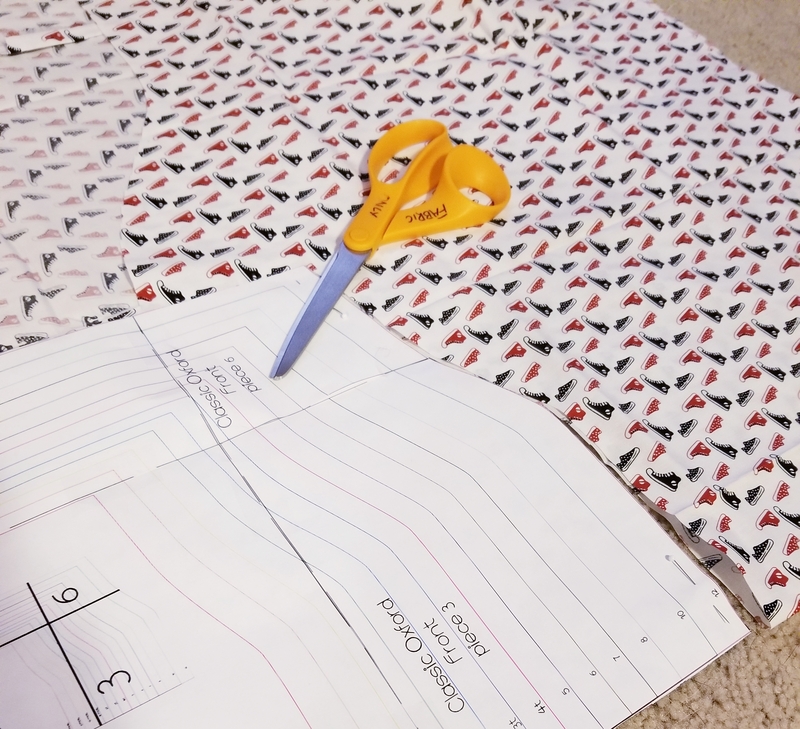 I decided to use the Classic Oxford pattern with this fabric – it’s something that I’ve made before and went together well, but also used the smallest amount of yardage that I could find in this style. 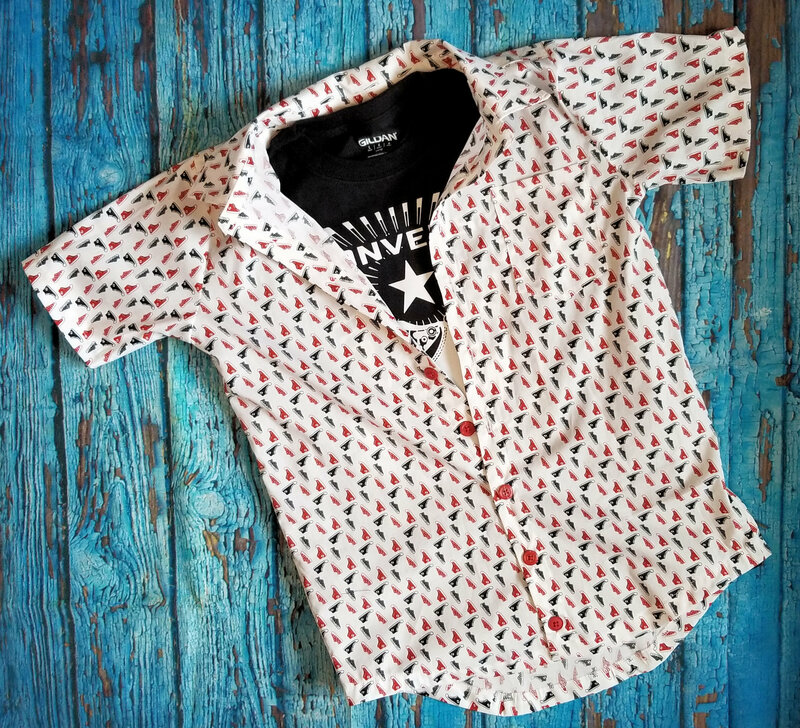 So, the big question is, can you make a size 12 boy’s (short sleeve) button down shirt with one yard of fabric? The answer is, “Yes you can, but I don’t recommend it”. 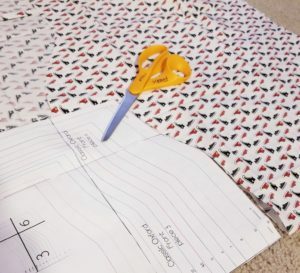 Fortunately this fabric is very wide (59″) so I had enough width to work with, but there was a lot of creative pattern placement going on to get everything to fit. Now that I’m finished with the hard part (or at least I hope it is), I’m anxious to get sewing! This entry was posted in Uncategorized on August 24, 2018 by stacy. Create a pleated midi skirt in any size. This Peek-a-boo Pouch is a great way to stay organized, but still know what you’ve stashed inside. This video tutorial is a great accompaniment to finish this project. While you’re visiting the site be sure to enter this week’s giveaway for a bundle of fabrics. This vinyl bag gives you two looks in one because it’s totally reversible! This simple cutout out top would make a great fall piece. Kick your fall sewing off with this pretty coat (you’ll need to translate this pattern if you don’t know Spanish). If you haven’t headed back to school yet, here’s another great backpack project for your first day.. Spruce up your kitchen with pretty new applique tea towels and fun pot holders (be sure to enter to win a copy of Diary in Stitches while you’re visiting, too). I’m finding myself being drawn to a lot of patchwork projects lately – like this beautiful quilted suitcase. This entry was posted in Uncategorized on August 23, 2018 by stacy. The last few days have given us a brief taste of fall. The blast of cool air makes me want to get started sewing a new wardrobe and what’s better than a new pair of cozy leggings? Last year I had seen a (ready to wear) company selling something very similar and loved the look. However, I wasn’t familiar with this brand and wasn’t sure what I would be getting so I never purchased it. Fortunately, Knitorious Fabrics designed a print that had the same sort of vibe as my inspiration. 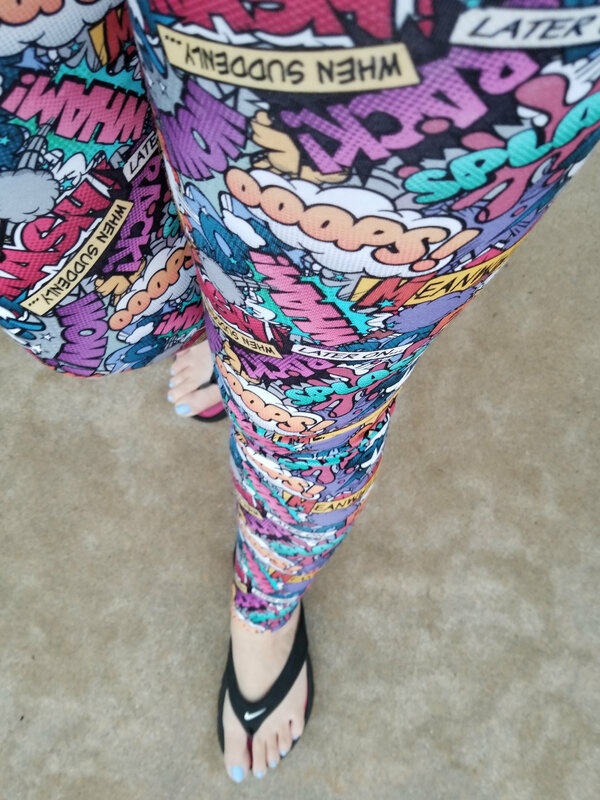 For my version, I used the Clara legging pattern and the comic words fabric that I received last month…. and it’s LOVE. The fabric has great stretch (so they feel fabulous on) and even after washing the colors stayed very vibrant. 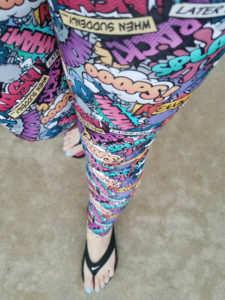 They are a bit “loud”, but they’re perfect for ComicCons, trips to the comic book store, or just because it’s Wednesday! This entry was posted in Uncategorized on August 22, 2018 by stacy. Oh bundles, how I love thee! Well, mostly. I have tried to resist some of the more recent So Sew English bundles, but I couldn’t help myself with the latest…. a distressed camo (no holes, just a great muted look in a cotton spandex blend). I’ve been looking for this sort of fabric for months (I had settled on this fabric which is a double brushed poly and much darker than what I had wanted and then a French Terry which is fabulous, but limiting in it’s uses… but made a great sweatshirt and hoodie). 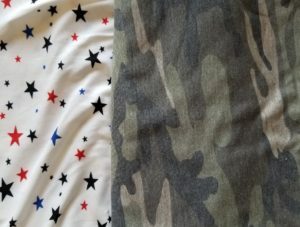 While I’m excited to put the camo to use, the stars are just meh, IMHO, and I’m just stumped as to how I might use it. This entry was posted in Uncategorized on August 21, 2018 by stacy. Ear buds are a school supply requirement (they were them for computer labs so they aren’t so disruptive). Those things not only get lost so easily not to mention nasty looking if they’re left out (or jammed in a pencil case)… so I always opt to make a case for them. 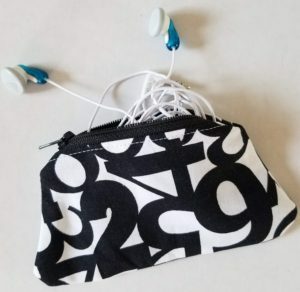 This year’s case was inspired by See Kate Sew’s Coin Pouch. I really loved the shape of her little bags, but since I was a bit pressed for time, I just winged it. I think the size is perfect, but my only regret is not boxing out the sides like she did – I think it might have been easier to stuff the wire into the bag (or at least give the appearance there’s more room), but we’ll see how it works out in the end (f I get complaints, you’ll be seeing a second version very soon). This entry was posted in Uncategorized on August 20, 2018 by stacy.